There are a lot of crazy things that you can do in The Sims 4 and one of them is… explore space! Indeed, you can have your own little rocket and go in space, either as an interstellar smuggler or a Space Ranger. And if this entire craziness sounds like something that you’d like to do, we are here to teach you how to build a spaceship and explore space in The Sims 4. And, of course, get rewarded with some really cool space-related collectibles. Alien fossils, anyone? So, in order to even have a chance at getting your Sim into space, you need to choose the Astronaut career path. You won’t be able to access the great fun from starters, so do your job well and get promoted, choosing to go either as the good guy (Space Ranger) or the villain (Interstellar Smuggler) – it doesn’t really matter what you choose. Next, go into Build mode and from the “Activities and Skills” category choose to buy the Steampunk Flyamajig for just 5,000 Simoleons and place it in your garden. You’ll need to actually build the rocket for 1,000 more Simoleons, but afterwards space is the final frontier that you can explore. Once your rocket is built, simply click it with your mouse and select the “Explore Space” option. Even though, unfortunately, you won’t get to see the whole space exploration thing, you will get a lot of choose your own adventure types of mini games and amazing results when you come back to earth, so I believe that it’s really worth it. Tip: Unless you upgrade your Rocket Science skill to the max and also upgrade your Spaceship to the maximum level, you run the risk of it crashing. So max everything out before your first visit in space! 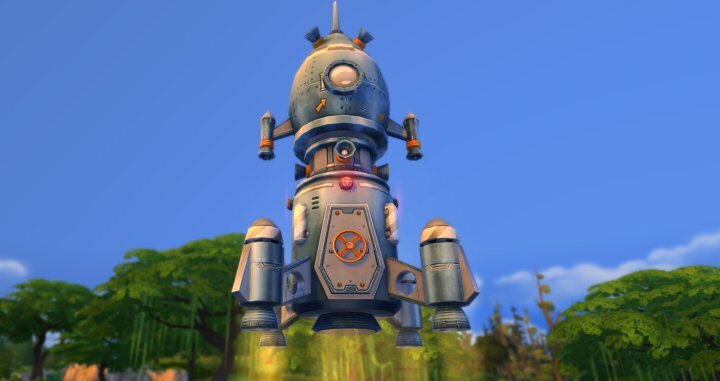 Now you know how to build your own rocket in The Sims 4 and how to Explore Space so have fun!